The best thing about a Fractal Design chassis is that you essentially know what you're going to get. Over the course of the past few years, the Swedish manufacturer has become a favoured choice among system builders seeking a no-frills enclosure that doesn't break the bank and pays attention to the finer details that rival brands may overlook. It is for these reasons that the firm's Define R5 is featured as the preferred enclosure for all high-end testing in the HEXUS labs, and Fractal is hoping to continue to make a positive impression with today's launch of the streamlined Define C.
Introduced as the latest addition to a growing Define Series catalogue, the Define C is being made available in plain (£78.99) or windowed (pictured, £83.99) variants and will slot in alongside the larger Define S and the fully-featured Define R5. Given that all Define Series chassis carry the same Scandinavian design philosophy, it can be tricky to tell them apart. On the one hand it's good to have a clear product identity - you know a Fractal chassis when you see one - but on the other hand the lack of variety limits the product's appeal. If you didn't like the aesthetic appeal of earlier Define Series enclosures, this new addition isn't going to change your mind. 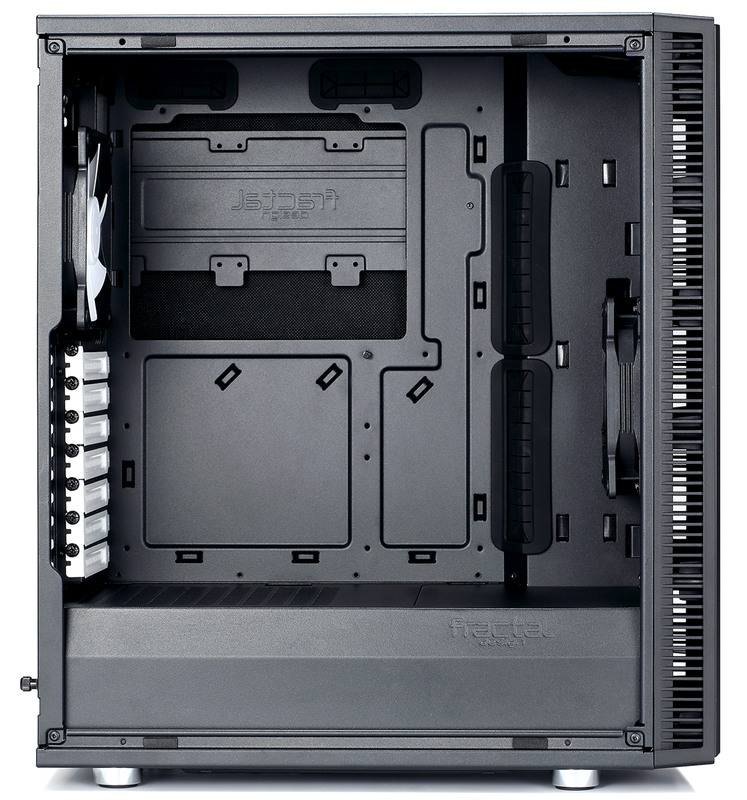 All-black exterior, four silver feet, a couple of white accents on the inside, a ModuVent panel on top, sound-dampening materials on the front and side(s), and a neat row of I/O ports spread across the top-front edge. This is exactly what we'd expect from a Define Series enclosure, though as we approach the latter end of 2016, we reckon Fractal has missed a trick by not revamping the I/O selection with USB Type-C. As it stands, you get the customary selection of audio jacks, reset, power (backlit) and dual USB 3.0 ports. So how exactly is the Define C different to the existing Define S? It all becomes clearer when you consider the overall size, as the new enclosure's 210mm (W) x 454mm (H) x 415mm (D) dimensions make it the thinnest and shallowest Define Series solution to support an ATX motherboard. 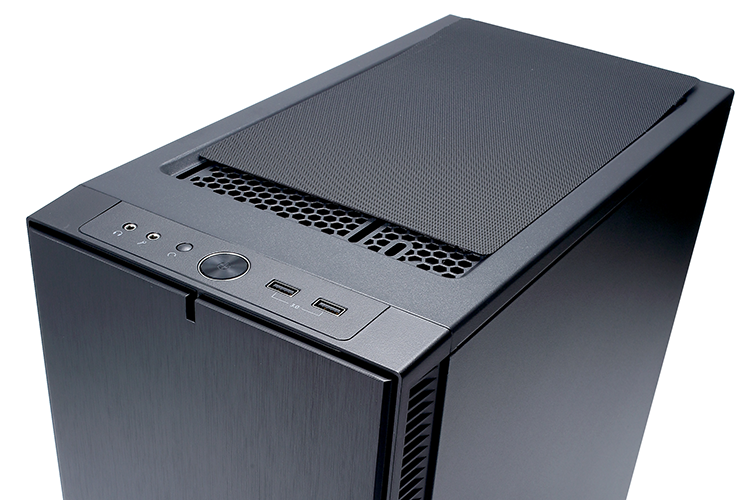 This is what manufacturers now like to refer to as "a compact full ATX form factor," and it's proven an effective way to jettison the 5.25in optical bays and shift the focus to the core components. The smaller profile makes implicit sense, as the Define S came across as sparse if a reservoir wasn't installed. Define C takes up less space and the final build should, in our estimation, appear sleeker. 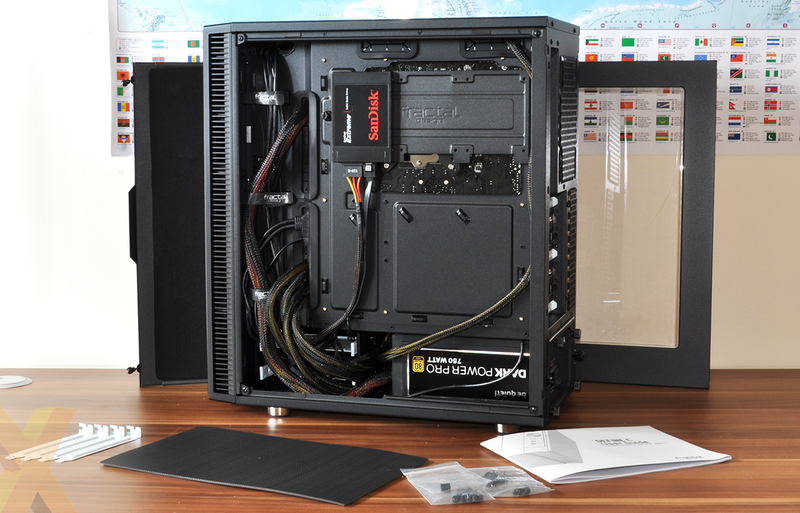 With tidiness in mind, Fractal has followed the recent trend of encompassing the power supply bay with a full-length shroud that completely hides cable clutter and 3.5in drives. It's nicely done, with rubber standoffs for the PSU, a rear fixing bracket, and a cutout section near the front of the shroud that can be removed to make way for an extra-long front radiator. A duo of three-pin Dynamic X2 GP-12 120mm fans are included as standard - one front intake and one rear exhaust - but there's plenty of scope to go beyond the default configuration. Removing the top ModuVent reveals dual 120/140 mounts, while the front of the case can accommodate a trio of 120s or two 140s. In terms of liquid-cooling opportunities, there's room for a 120/240mm radiator (up to 40mm thick) up top, or a 240/280/360mm radiator in the front. Ample room for most high-end users to play with, and true to form Fractal doesn't skimp on the details. 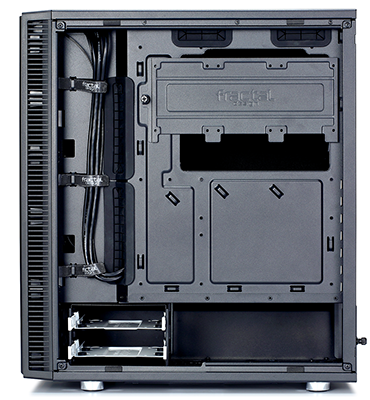 Four rubber-grommeted cable-routing holes are positioned conveniently above and to the right of the motherboard tray, the bottom dust filter is full-length and pulls out easily from the front, and there's another full-size filter behind the removable front panel. If you're at all bothered by presentation, you'll also appreciate the fact that all the bundled screws are neatly sorted into individual sachets, while the illustrated manual does an excellent job of navigating novices through the build process. 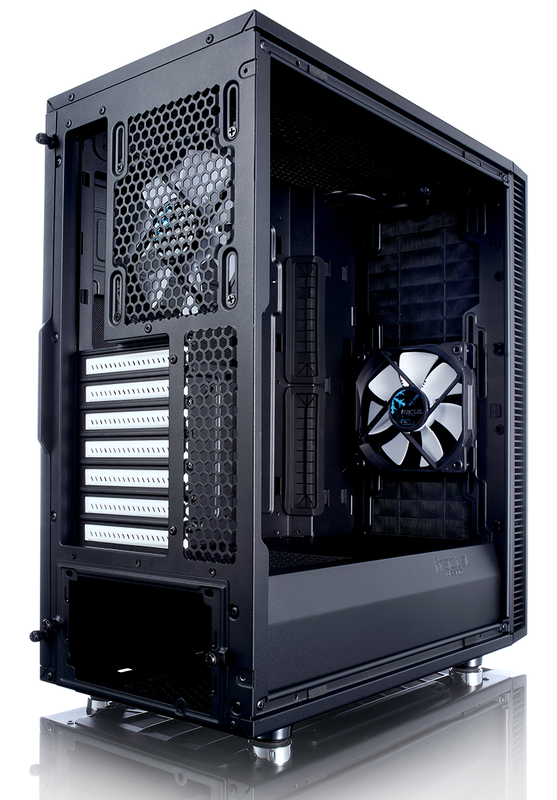 Define C is geared toward keeping noise output to a minimum in its out-the-box setup, but should you favour airflow and in particular a top radiator, the solid ModuVent panel can easily be swapped for a mesh panel that's included in the box. Graphics cards, meanwhile, can measure up to 315mm in length, while a CPU cooler can stand up to 168mm tall, and the only obvious omission from a bundle point of view is the lack of a 140mm fan as standard. How much storage can Fractal squeeze-in having trimmed the chassis down to size? Well, there are two 3.5in trays located in a drive cage positioned toward the end of the PSU compartment, and once again, the details count as the trays are rigid metal with pre-installed rubber standoffs. Said drive cage is removable should hard disks be surplus to requirements, and you'd still have a trio of 2.5in bays to play with. These are located on a metal bracket that attaches to the back of the motherboard tray using a single thumb screw. Offsetting the column alongside the motherboard tray and lining it with three Velcro tabs works wonders for cable management, and there are plenty of tie-down points elsewhere. 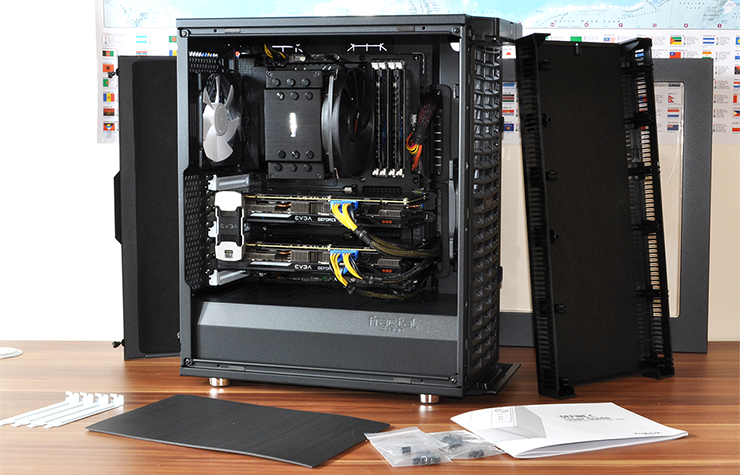 There isn't a massive amount of room back here, yet even so, the hinged side panels are easy to attach and we didn't have any trouble keeping things tidy with our dual-GPU test platform. The only change we'd make is the addition of a grommeted cable-routing hole in the roof of the PSU shroud, allowing for cables to easily pass through to the graphics card(s). All things considered there's a lot to like for fans of Fractal chassis seeking a smaller ATX solution, however in order to keep costs down certain features have been omitted and the Define C is in some ways a second-class citizen compared to the feature-packed Define R5. 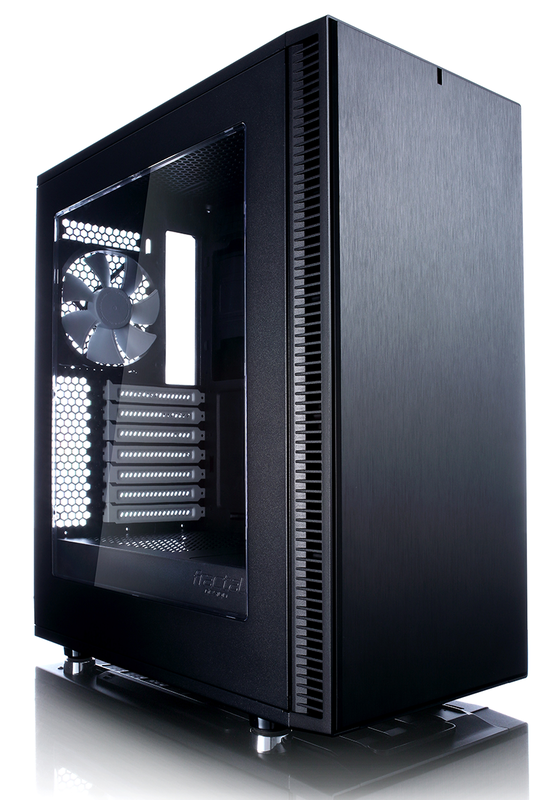 There's no built-in fan controller, the quick-release side panel has fallen by the wayside, and if space or form factor isn't the determining factor, it's worth noting that the Define R5 is now available for just under £100.